GALION — Workers wait atop a radio tower afternoon under construction Wednesday just north of the Brandt Road, North Market Street intersection. 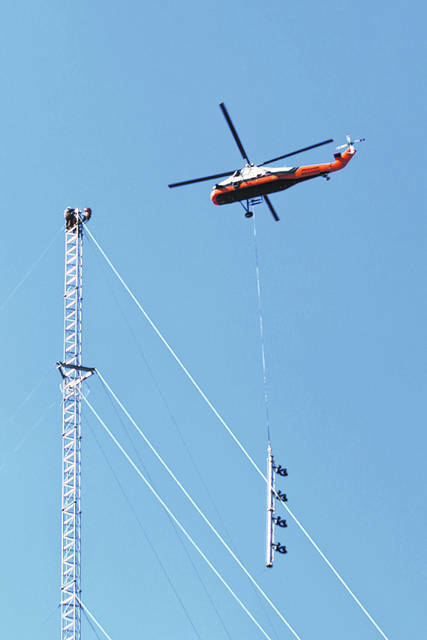 The helicopter was lifting the final section of a tower that is more than 300 feet tall. The workers grabbed the section as the helicopter hovered above them and bolted it into place. The tower, owned by I Heart Radio, will be leased by local radio station 102.3 The Fox, which was knocked off the air in September of by last year’s Labor Day weekend tornado. See another photo of the tower on Page 3.